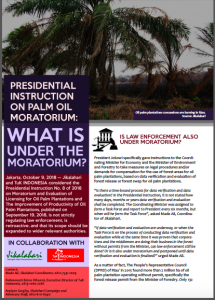 PRESIDENTIAL INSTRUCTION ON PALM OIL MORATORIUM: WHAT IS UNDER THE MORATORIUM? 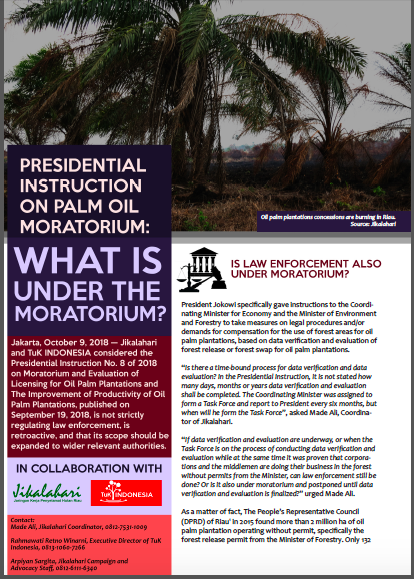 President Jokowi specifically gave instructions to the Coordi­nating Minister for Economy and the Minister of Environment and Forestry to take measures on legal procedures and/or demands for compensation for the use of forest areas for oil palm plantations, based on data verification and evaluation of forest release or forest swap for oil palm plantations. “Is there a time-bound process for data verification and data evaluation? In the Presidential Instruction, it is not stated how many days, months or years data verification and evaluation shall be completed. The Coordinating Minister was assigned to form a Task Force and report to President every six months, but when will he form the Task Force”, asked Made Ali, Coordina­tor of Jikalahari. 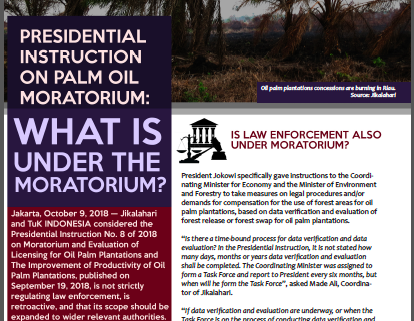 “If data verification and evaluation are underway, or when the Task Force is on the process of conducting data verification and evaluation while at the same time it was proven that corpora­tions and the middlemen are doing their business in the forest without permits from the Minister, can law enforcement still be done? Or is it also under moratorium and postponed until data verification and evaluation is finalized?” urged Made Ali.  https://www.tuk.or.id/wp-content/uploads/2018/10/Screen-Shot-2018-10-25-at-2.10.11-PM-1.png 579 414 Mubarok Khalid http://www.tuk.or.id/wp-content/uploads/2018/12/Logo-Tuk-Indonesia-340-300x136-300x136.png Mubarok Khalid2018-10-25 15:40:112018-12-28 15:59:56PRESIDENTIAL INSTRUCTION ON PALM OIL MORATORIUM: WHAT IS UNDER THE MORATORIUM?